Supervillians have their own unique way of protesting bank charges. Today’s investment advice has been sponsored by Empowered Special #7: Pew Pew Pew! (November 2015) by Adam Warren. 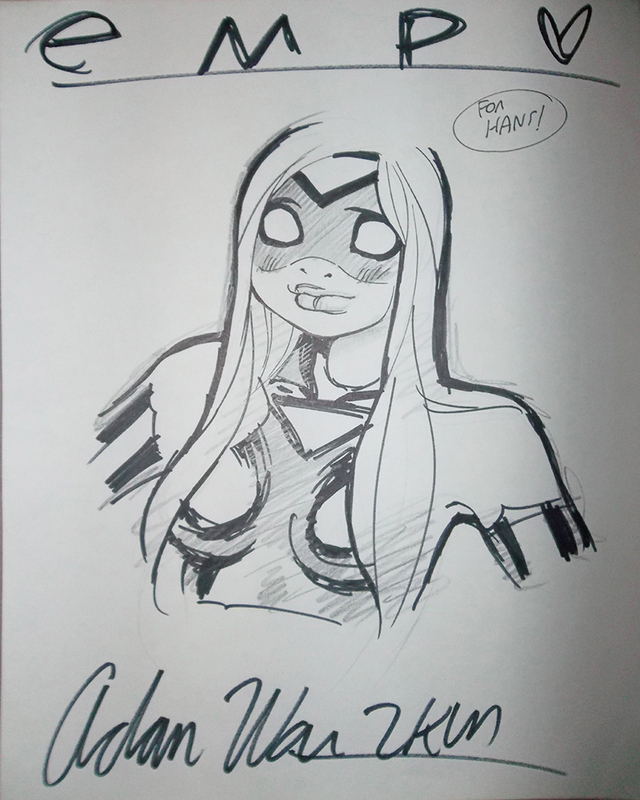 Here’s yet another of my more recent acquisitions: a sketch of Empowered by her creator Adam Warren straight from Fan Expo 2014! 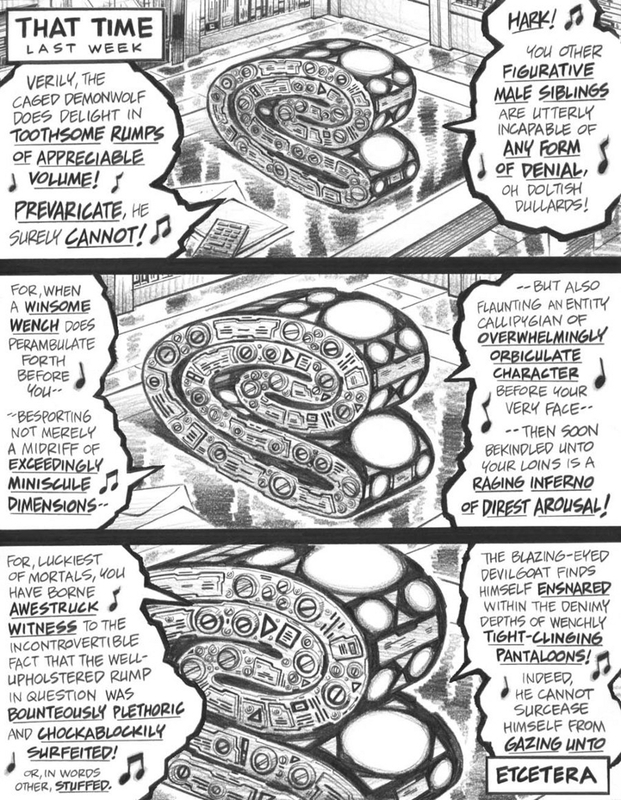 There’re some pretty messed-up alternate timelines in the Empowered Multiverse. 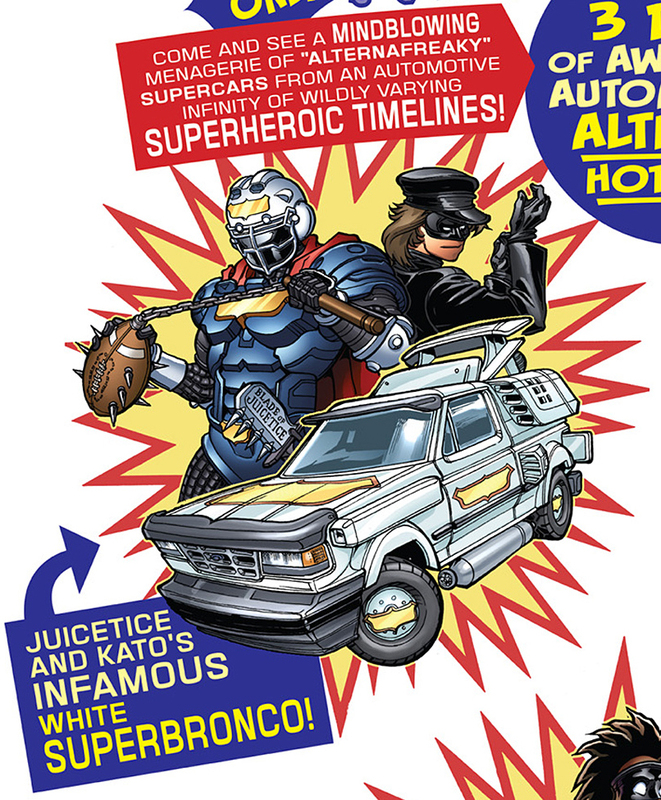 I wonder if his battle cry is “The Juicetice is loose!”? This vision of what might’ve been courtesy of Empowered Special #4: Animal Style (June 2013) by Adam Warren and John Staton. If anyone remembers Syndrome and Dollar Bill’s fates in The Incredibles and Watchmen, respectively – or even Edna Mode’s extended diatribe in the former – you’d come to the conclusion that wearing a capes is a very bad idea when it comes to superhero and supervillain costumes. So why do so many members of the spandex crowd wear them? 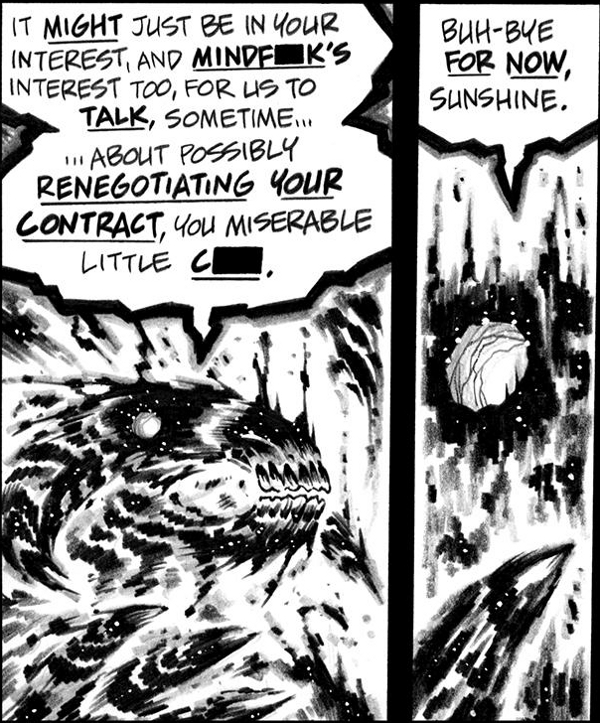 Well, according to Empowered, you may as well chalk this one up to insecurity and body image issues. I wonder if J-Lo and Kim Kardashian wear capes in the Empowered Universe? 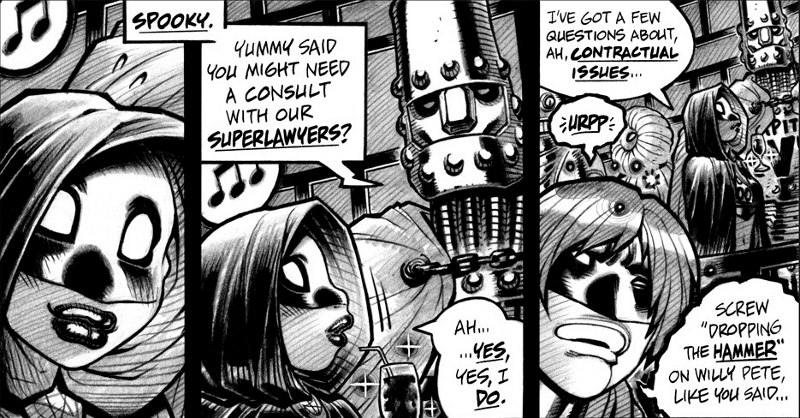 While the above panel from Empowered – Volume 1 (March 2007) by Adam Warren answers half of the question, it just calls more attention to the unanswered half: namely why so many male superheroes and supervillains wear capes. Perhaps the world will never know. Being a superhero(ine) means having access to an entirely new list of excuses when it comes to explaining away your cheating. After a hat trick, where’s the shame supposed to fall again? 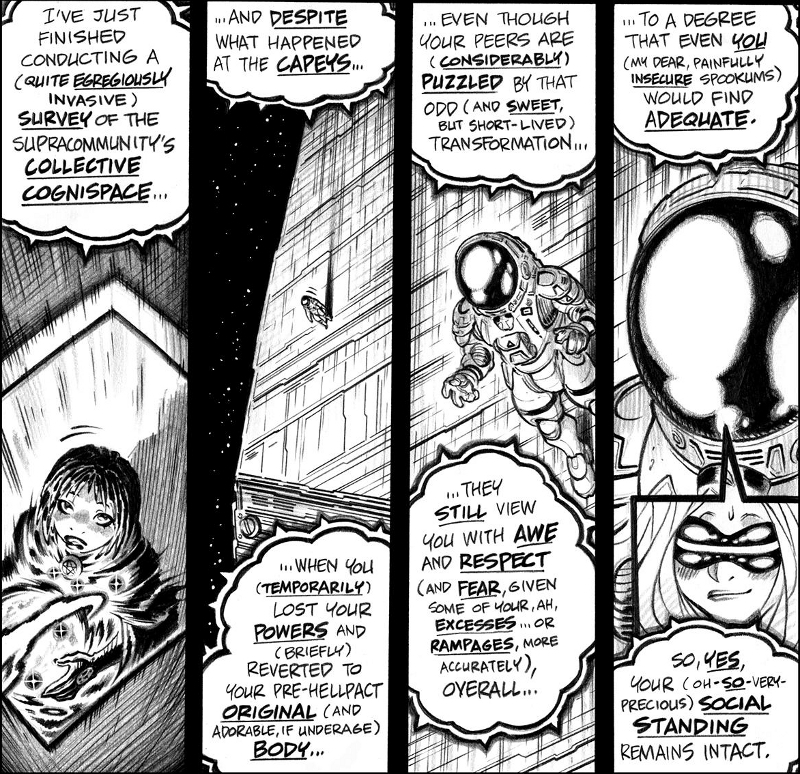 This exploration of suprahuman commitment issues courtesy of Empowered – Volume 7 (May 2012) by Adam Warren. Note to female readers: if you’re extremely body conscious, then becoming a superheroine probably isn’t for you. Think sexual harassment in the workplace is bad? Try SUPER sexual harassment. 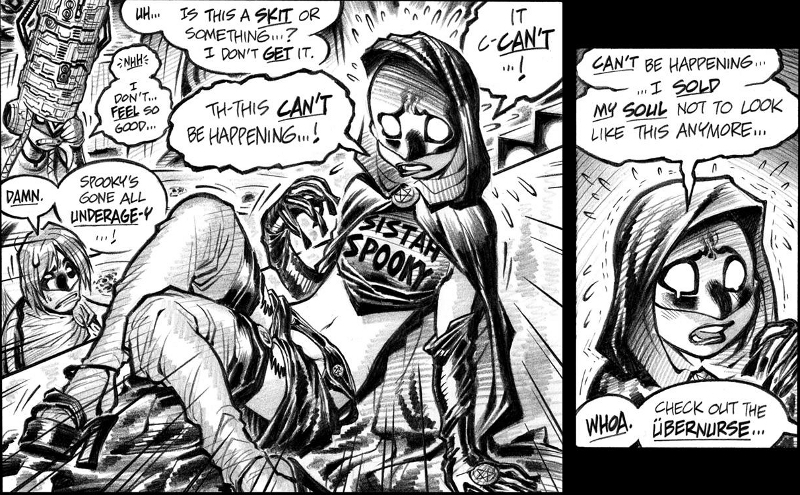 This uncomfortable moment in the spandex lifestyle has been brought to you by Empowered – Volume 1 (March 2007) by Adam Warren. There’s only one thing creepier than getting off on death. And that’s Death getting off on you. Ladies and gentlemen, I believe we've discovered a new type of necrophilia. 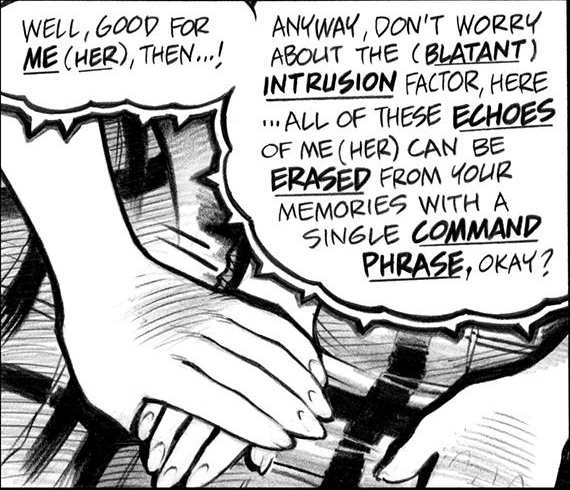 This sexually disturbing metaphor courtesy of Empowered – Volume 6 (September 2010) by Adam Warren. It seems that, no matter what world you’re on, there are always certain groups you can count on to cause trouble. 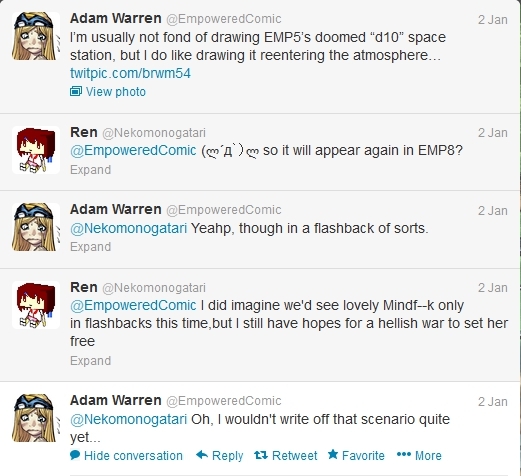 This suspected trolling attempt courtesy of Empowered – Volume 5 (June 2009) by Adam Warren.